Compatible with iPhone and iPad, the Belkin MIXIT Lightning to USB Cable makes charging and syncing your Lightning connector devices quick, safe and easy, wherever you are. 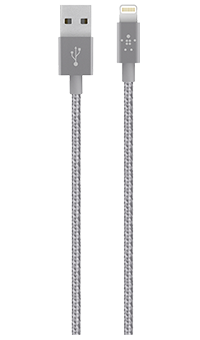 Belkin's Lightning to USB cable is a perfect match for your iPhone or iPad – certified by Apple to meet their high performance standards. Simply plug the cable's USB end directly into any USB 2.0 port to stay connected at home, at work, or on the road. Compact and portable, the 1.2 metre MIXIT Lightning to USB Cable has you covered for charging and syncing, however you use it. Connect to your laptop, USB wall charger or USB car charger and keep your Apple devices up and running – fast as lightning. The cable's slim design means you can keep most cases on your device while you charge. And with a range of tasteful metallic colours available, it's easy to match your Lightning to USB cable with your phone, tablet and personal style.